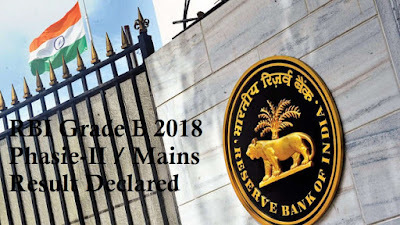 RBI has released Result of Phase-II examination for Direct Recruitment of Officers in Grade ‘B’ (General) - BY- 2018. RBI Grade B 2018 Mains / Phase-II Online Examination was conducted on 15th September 2018. List of Roll Numbers of Shortlisted Candidates for Interview has been released. The interviews will begin tentatively from last week of October, 2018 and will end in January 2019. The interview call letters (with New Roll Numbers) indicating date, time and venue of the interview will be sent separately in Phases (in due course) on their registered email address. Candidates are requested to check their mailbox, including spam and junk box for the same.